U.S. Marine Sgt. Jesse Taylor (left), a communications equipment operator, runs alongside Lt. Col. Matthew Palma and Sgt. 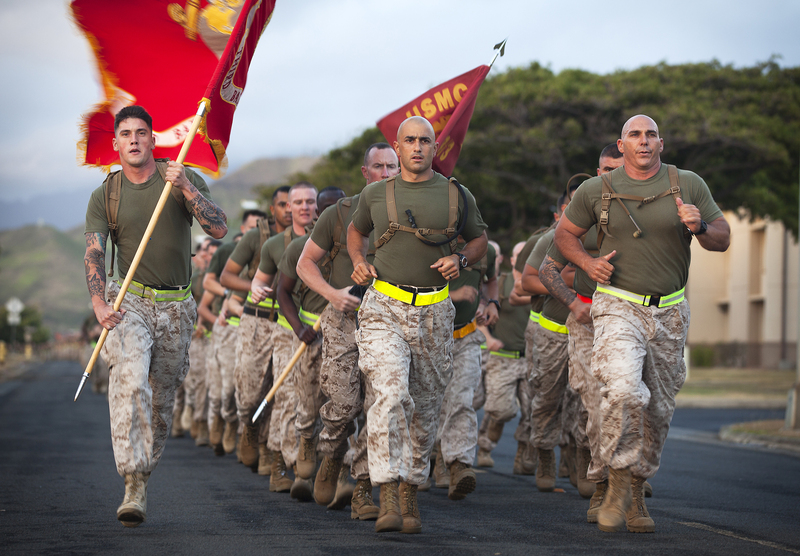 Maj. Andrew Cece (center and right), the commanding officer and sergeant major of 3rd Battalion, 3rd Marine Regiment, and approximately 3,000 Marines and sailors during a memorial run here, June 1, 2012, to honor the sacrifices of 116 men from 3rd Marines who died during combat operations in Afghanistan and Iraq. The regiment’s three battalions began supporting Operations Enduring and Iraqi Freedom in 2004 and during this course became the highest-deployed Marine infantry regiment. The regiment’s 3rd Battalion recently returned from its third Afghanistan tour, marking the last scheduled combat deployment there for 3rd Marines.